The 2018/2019 season was very good, but not necessarily superlative. On occasions there were quite disturbing longer periods of blue thermic, which hindered long distance flights.There were also super days where flights of more than 1300km were possible. Most important: no accidents, and apart from a few minor repairs all went well. It all started in November with relative long flights. Although there were mixed clear days, nevertheless good thermic and high altitudes, eg. more than 5000m. The first thousand was achieved in middle of November, and the weather continually improved to the month‘s end. Just for interest: in the meantime, November is much better than claimed! Solely flight times are shorter because the sun sets earlier. But this is off-set with reliable thermic and high ceilings. December started off good, although a number of cold fronts from the Cape made longer phases whereby flights were only possible with brakes set, (in a sort of way!). Quite clear and mostly lower. A number of super days were had in December, notably on the 14.12 there were seven flights over 1000. After Christmas it turned somewhat wet (prior to the season‘s begin it rained which pleased the local farmer‘s in so much that they had the chance to sell more lamb‘s before Christmas). The dampness called for covering up during the day, therefore a few days of reflection were planned. A clear phase developed after a few days, and towards season‘s end a few marvellous days came along, unfortuately these days could be utilized by a few pilots as most of the aircraft had been packed. New in this season (resp. made possible again), was access to the northern airspace (up to FL 145). This enable flights beyond the normal glider area, especially flights on days where the southern area was clear. A vector was established up to 350km to the north. 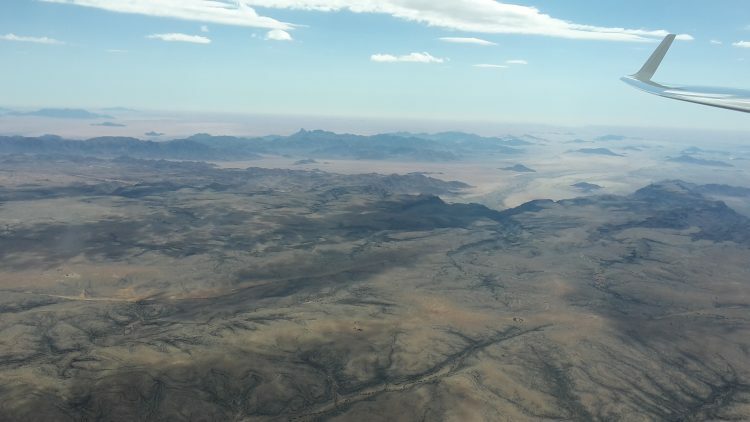 Some risked flying around Windhoek, albeit a rather tough assignment due to the max FL145, mountains in the west which lowered the reserves plus the far and few possibilities for emergency landing‘s. Generally speaking the additional airspace was welcomed by all the pilot‘s. Generally speaking, after a time more days were flown NE resp. N. Very few days westwards this year were possible. A few very good angular build-ups quite often but not typical developed a late convergent situation which could be flown only by whoever was in the vicinity. Forever there were fantastic views of mountainous terrain resp.the desert and lively flights with high average speeds. Exceptional flights were achieved by Alexander Müller with over 1300km. Two Danish crews set a record this year (total of 4 Danish records): three were achieved by Klaus Hagensen and Steffen Ellberg, one record was flown by Claus Elmeros and Klaus Juhl. With 492 flights and 365.387km, regardless of the blue thermic phases the season proved satisfactory. All this may be thanked from the attentive and disciplinary attitude of the pilots. 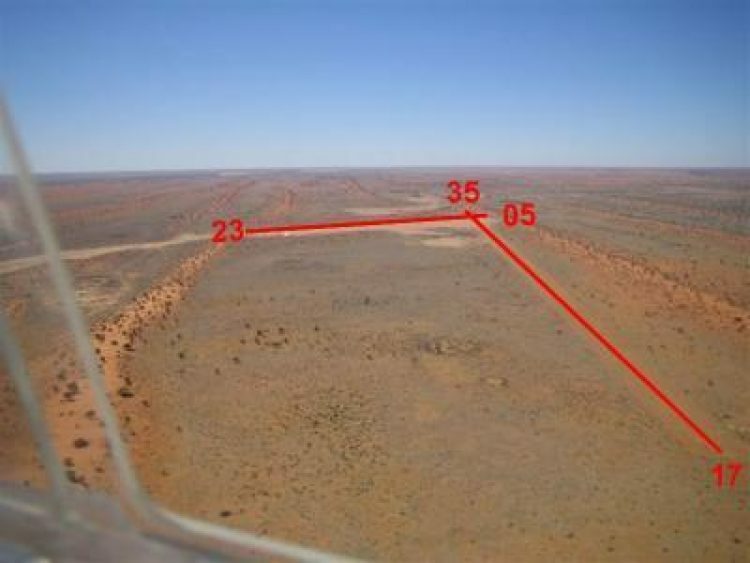 The airfield constitutes an almost 2.7km long and 60m wide main runway (direction: 35/17) and a clay pan almost 950m long and 500-600m wide (direction: 23/05). In an extended direction of the main runway (35) is an emergency runway of another 1000 x 50m. This enables an emergency landing straight ahead in case of engine failure. Pokweni´s elevation ist 1 250m above sea level with coordinates S:23 39' 00” E:17 43' 48". Take-off normally takes place from runway 35. With strong wind from direction 05/23, it is possible for single seaters to take off from the pan. Landing takes place on any runway, but is mostly done on 05 with roll-out towards the shadenets. Also, when the pan is flooded after a thunderstorm, flying on Pokweni is no problem. Take-off and landing then takes place on the main runway 35/17. The gliders are towed to the main runway via a short by-pass. For more than 10 years already Pokweni has had shadenets available for aircraft to park under. This also makes it more convenient for flight preparation. The shaded area blocks out about 60% of solar radiation. 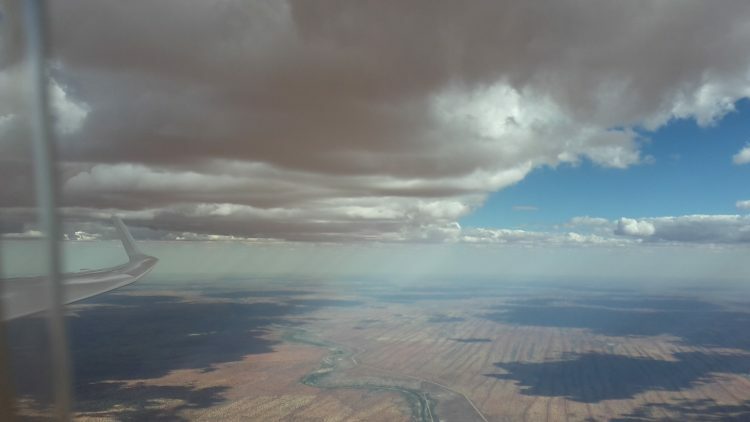 The planes and pilots alike are protected against the merciless Namibian sun and the ultra-violet radiation. In autumn 2018 the shade nets have been enlarged for another 60 m, so now each glider has a place under the net. All in all it comprises 330 m.
There were some years where airspace structures changed very much, but today the situation has been established. Most flights take place in the Gliding area up to FL 195. Inside there are some TMZ where you need a transponder and listening Radio Windhoek is obliged. A new possibility is to leave the Gliding Area to the North up to FL 145 (Attention!). If you take care concerning the altitude very nice long distance flights are possible. Flying into Botswana is allowed till 2 ½ ° East of the Namibian border and also the northern part of South Africa till Lendlpas can be used. You can find the exact items on the website of the SSN (Soaring Society of Namibia). There you get all important information about flying in Namibia and the versions of the current airspace can be uploaded.